Gate to Ireland’s Historic Quin Abbey in County Clare. 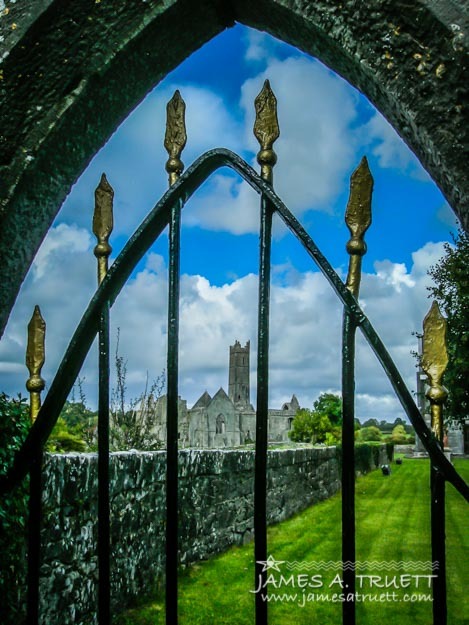 This painted iron gate opens into the courtyard of St. Mary’s Church, in Quin, County Clare, Ireland, with one of Ireland’s National Monuments, the 15th Century Quin Abbey, in the background. The history of this site actually goes back to around 1250, when an abbey first was established there. It was destroyed by fire in 1278, and a Norman castle was built on the site in 1280. Destroyed in an attack, parts of the castle ruins were incorporated into a church built in 1350 by the MacNamara clan. In 1433, the property was passed to the Franciscan order, and they established a friary. King Henry VIII confiscated Quin Abbey in 1541, turning it over to the illustrious O’Brien clan. Though friars were allowed to continue living there, Quin Abbey fell into ruin until the MacNamaras regained possession in about 1590. With assistance from local families, the Abbey was substantially restored, and, by 1640, it had become a college with as many as 800 students. Unfortunately, that period of higher learning was short-lived as Cromwell’s forces stormed the Abbey, killing monks and destroying many of the historic buildings in 1651. Twenty years later, the Franciscans had returned and restored the Abbey yet again, only to be faced with further political and military interventions. By 1820, the last monk to inhabit the Abbey ruins died. Quin Abbey, now administered by by Ireland’s Office of Public Works, became a national monument in 1880.